An astral power is rising. While Deborah sends her minions out to gather supplies and spy on Richard and the wrecked ship, Richard and his friends learn how to actualize reality using the power of the ship, and they organize a rescue of the aliens inside the wrecked ship. But there are other forces at work more menacing than anyone can imagine – Forces that will stop at nothing to alter to balance of control all over the world. 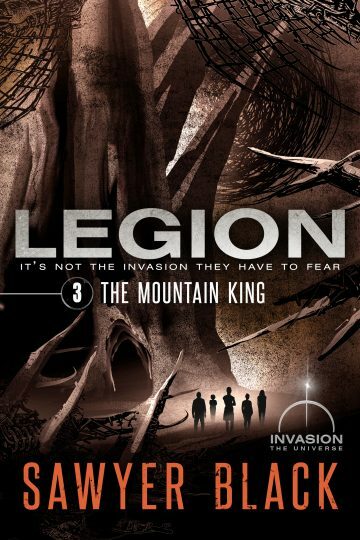 The Mountain King is the third book in Sawyer Black’s Legion series, set in the bestselling Invasion Universe. If you are looking for a dark, action-packed thrill ride reminiscent of Under the Dome and Alien Nation, you’ll love The Mountain King. Pick up your copy today!